Gus Van Sant's "Paranoid Park" is told in such a mesmerizing circular fashion that it perfectly emulates the act of riding a skateboard. 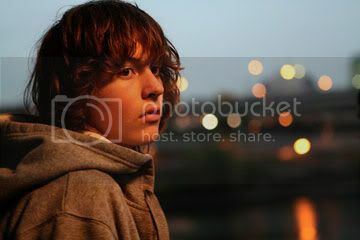 The movie's title refers to not only a rough, illegal skateboard park under a freeway in Portland, Oregon but also the confused conscience of a teenage boy skateboarder named Alex (Gabe Nevins) who spends an evening in Paranoid Park that will follow him for days to come. The movie is based on a novel by Blake Nelson, and it follows Alex through the course of the days after a terrible incident as he recalls the events in a journal. He's writing it all down, but he reminds us that none of it will be in order because he didn't do so well in creative writing, but in the end, it will all make sense. One day, Alex decides to check out Paranoid Park with his friend Jared (Jake Miller), and they plan on a day later where they will actually skate there. When the night arrives, though, Jared bails out leaving Alex to go alone. While there, Alex meets up with an older kid and rides on the side of a freight train with him. And then something happens. As the narrative continues to swirl in arcs and curves through time, we discover that a security guard was killed at the train tracks. His body was cut in half by a passing train. There's an autopsy, though, and it reveals that he was first hit in the head with something. A skateboard with DNA from the crime scene was also found ditched into the river. During school, Alex is called out of class to speak to a detective (Dan Liu) about the murder. He carries on a casual, low-key conversation with Alex, asking him details about the evening he spent around Paranoid Park. Alex responds how a teenager would, which is something surprisingly refreshing about this film. The teenagers here, for once in a movie, talk and act like real teenagers and are played by real teenagers. (They were recruited through a Myspace page.) It's not only in this interrogation that Alex is somewhat in a fog but also in every other aspect of his life. His parents are in the middle of a divorce, and his girlfriend (Taylor Momsen) is a virgin just dying to be deflowered by him. He sleepwalks entirely expressionless through his days at school and at home, all in a typical teenage fashion. Even in the way Alex retells everything through his writing, his voice is flat and emotionless, and yet, we know something very well happened. He gets the idea to write it all down from a friend of his, Macy (Lauren McKinney), who says it's better to express it on paper. Once it's all written out, he can send it to someone, just keep it, or burn it. It doesn't matter at that point because the important part is simply writing it. Sitting across from Alex at a cafe table, Macy asks him if something happened. He at first says it's nothing, but then he changes his mind. We, too, like Macy, realize that something is wrong. The movie has a distinct sound design to it along with stark and beautiful visual camera work from noted cinematographer Christopher Doyle. As the series of events become clearer and clearer in our minds, we feel the emotional burden of Alex and understand the sickening feeling he has in the pit of his stomach because we, too, have it right along with him. It's in this sense that we get an unflinching glimpse into the true experience of adolescence. Gus Van Sant's direction becomes crucial to the storytelling as he uses sound bites from a wide range of music, scenes of skateboarders in grainy 8mm film, fades in and out of overexposed and dim lighting, and sequences of prolonged slow-motion. None of this is in any sense gimmicky because of the way it mirrors exactly what is going on inside Alex's mind. It gives the audience the correct perspective, grabbing us and haunting us. "Paranoid Park" is a movie about guilt, longing, youth, and death. It's about unintentional actions that hit hard and have unpredictable repercussions within ourselves. And it's about dealing with these actions and living with what we've done. It's a small movie but a triumphant one. What strikes hardest about Gus Van Sant's latest film is its emotional power and intimacy throughout an embracing vision. As Alex's friend Jared tells him, no one is really ever ready for Paranoid Park, but it's also a place you have to see for yourself.